It's difficult to not feel indifferent about a movie like Trolls. In the end, it's fine. Is it somewhat offensive in terms of originality and cheap covers of gloriously good pop songs? It could certainly be taken that way, but when taking into consideration the target audience for this latest DreamWorks animated adventure it's hard to get too frustrated with the rote story Trolls tolls out or the advantage it takes in remixing recognizable songs into auto-tuned Kidz Bop versions you could have certainly lived without. 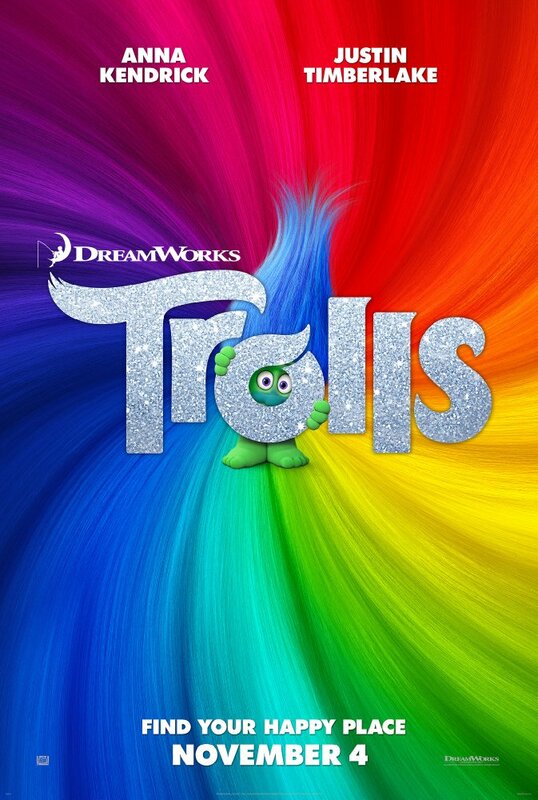 Of course, Trolls doesn't mean to offend, but rather it simply means to entertain a fairly wide age range of kiddos while at the same time giving over tried and true lessons that deal in being true to one's self to find true happiness. 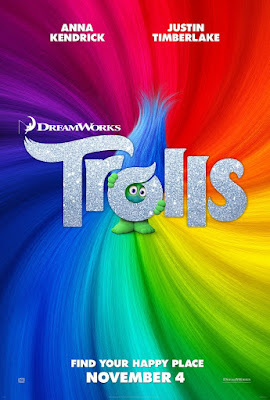 No, Trolls isn't either a good film or a particularly bad one, but more it is simply one that exists to colorfully distract for an hour and a half only to mostly be forgotten the next day. No harm, no foul. Trolls is ultimately something of a mix between DreamWorks own Shrek series as far as character types go while more or less the same story The Smurfs told us as far as being small creatures who live in peace and harmony while having to battle a much larger being who threatens to eat them among other evil things. There wouldn't be anything necessarily wrong with restructuring these archetypes and plotlines were Trolls interested in doing anything fresh or interesting (and when I say interesting I, obviously, mean weirder) with as much as they've given themselves to work with, but by simply slapping a variety of pop covers throughout rather than going full-on musical and ultimately being more harmless than memorable this movie isn't exactly the kind of product a studio wants to put out if they want to retain any type of credibility. Though it really is difficult to say anything downright terrible about Trolls the bottom line is this was a product made to move merchandise and that it actually turned out as competent and sometimes even as fun as it is shouldn't be forgotten. Sure, one could point out the desperate lengths movie studios are now going to in order to cash in on brands given the troll dolls were first popular in the sixties (with a resurgence in the nineties) or one could point to The LEGO Movie as a film based on toys/superfluous junk that actually turned out rather inspired and great, but somewhere in the middle of those truths and thoughts we find Trolls; just happy to have been given enough room to dance and sing and hug. Princess Poppy (Anna Kendrick) and Branch (Justin Timberlake) do not share the same outlook on life at the beginning of Trolls. With Shrek long past his prime, the Madagascar gang more or less in retirement with the Penguins not so successfully backing them up, and neither Po the Ninja Warrior or Hiccup and Toothless producing sequels that exactly lit the world on fire it was time for DreamWorks to officially try something new and it seems they put all of their eggs in the Trolls basket. I can't say whether or not this was the right move for the studio given they've obviously advertised the mess out of this thing and expect (and are seeing) solid returns, but whereas the first couple of Shrek's and both the Kung Fu Panda and How to Train Your Dragon movies were considered generally good to great films that could compete with the likes of Pixar Trolls is decidedly a step backward in terms of just how lofty DreamWorks ambition might be for their future endeavors. It could be a smart move to try and no longer compete with the likes of Pixar and instead carve out their own niche as the studio who focuses more on the younger children in the audience; turning out big-budget features they can experience on the big screen without parents having to concern themselves with whether or not their child is ready for serious themes about life, love, and loss. There's nothing wrong with going a different route, of course, and again Trolls wouldn't feel as easy to dismiss if different automatically equaled good, but unfortunately it doesn't. Rather, Trolls plays like a pilot episode for a series of movies DreamWorks only hopes they will be able to rely on for the next few years to maybe a decade. It's difficult to buy into the idea this movie could spawn such an empire given the characters aren't overly endearing despite there being a sprawling cast for them to pull from should the need to expand such a universe arise, but here we are. Worse still than the fact Trolls feels somewhat temporary, or as if it is simply testing out the waters to see if audiences will welcome it to the deep end, is that one can easily see the potential within Trolls for it to be that much better and that much more unique of an experience. Meaning it's easy to see clear opportunities within the film as it plays where certain things could have easily been done to enhance the experience. Things that would have aligned with expectations the movie was giving us, but that it doesn't trust itself enough to follow up on or invest in. Instead of daring to take such routes we instead get a road trip movie that leads to a type of redemption that can be glimpsed a mile away. And so, we are introduced to the Bergen's, a race of ogre-like beings that live on what looks like a scorched version of earth or hell, some Bergen-plagued planet in a different galaxy far, far away for all I know, where there is a monarchy of some sort and the young prince, Gristle (Christopher Mintz-Plasse), is about to experience what his father (John Cleese) and the rest of their kind believe is the only way to find true happiness-eating a troll. They, for one reason or another that is never explained, only do this one day a year on what they call "Trollstice". Why they only desire to be happy a single day out of whatever their calendar year might consist of is curious, but it seems to be for reasons so that Chef (Christine Baranski) can collect enough of the long, multi-colored dolls so that every Bergen in the village has a troll to eat. I thought you said this was for younger children? Why all the talk of cannibalism so early on? Is it still cannibalism? Are trolls and Bergen's the same species? Does the Bergen planet have Ancestry.com? Needless to say, on the day little Gristle is set to eat his first troll there is an escape plan hatched as the King of the Trolls, King Peppy (Jeffrey Tambor), leads his people (or trolls) out and away from the Bergen village, but not before risking his life to put others before him as well as to save his daughter, Princess Poppy (Anna Kendrick). Fast-forward twenty years and the trolls have somehow managed to stay quiet enough despite their tendencies to break into song to stay hidden from the Bergens with Poppy becoming a central hub for the scrap booking, singing, dancing, and hugging that seems to keep the community of trolls going day in and day out. Naturally, given their twenty years of freedom from the Bergen's, the trolls want to celebrate and do so by not only singing, and dancing, and hugging, but by putting on a fireworks show that, unsurprisingly, attracts the attention of Chef who has yet to live down that mistake that happened once upon a time. Chef then swiftly acts to kidnap a group of trolls forcing Poppy to resort to asking Branch (Justin Timberlake), a troll who has sworn off all the dancing, singing, and general cheerfulness for a life of seclusion and safety should the Bergen's ever return, for help rescuing her gang of friends and join her in fighting to maintain their way of life. Prince Gristle (Christopher Mintz-Plasse) and Bridget (Zooey Deschanel) find a spark of happiness they didn't know possible. What exactly is appealing about Trolls then? Well, for starters the voice cast makes all of this a lot more bearable as they are clearly aware of the type of movie they have signed up to be a part of and are having a blast just going back and forth with one another. Also, once the movie more or less digs into the standard plot of which more mature audience-members will recognize the beats for long before they actually occur Trolls adds an unexpected layer in the presence of Bridget (Zooey Deschanel) who is a Bergen that agrees to help Poppy and Branch rescue their friends from Gristle, but not before enlisting the trolls to help her impress the prince who she's harbored affections for for some time. Bridget is a sensitive and kind presence in a world that otherwise feels it's been hopped up on sugar for far too long. Deschanel brings a poignancy to her role and to the film that isn't found anywhere else as it is her arc that allows the otherwise rote themes to feel somewhat genuine and affecting. She is selfless in her willingness to help the trolls and go against all she has been taught throughout her life despite holding out feelings for the one Bergen who desires to eat a troll more than anything. As Gristle, Mintz-Plasse does some solid work creating an actual character through his vocal performance. Those not so lucky to have time to actually develop an actual character or more of a personality are the appealing likes of James Corden, Gwen Stefani, Kunal Nayyar, and unfortunately even Russell Brand who all form part of Poppy's posse and are given little else to do other than poop cupcakes, burp glitter and serve as plot devices. And then there is the dynamic of Timberlake and Kendrick who, obviously have nice enough singing voices to carry the load of what Trolls is wanting to accomplish and convey, while at the same time being likable enough to not let those who already didn't expect much from the film be let down even more. Timberlake has always been an actor that one can see through to a degree. You can see him trying to perform when acting whereas on stage as a performer he's clearly more in his element. That slight insecurity is still heard in his vocal performance, but Kendrick is as quirky and pleasant as ever and her opposites attract dynamic with Timberlake's Branch is sweet enough to bring both performances home in good standing. Will you remember much about Trolls the day after you see it? No, but you'll probably still be humming a few solid tunes so again, it's hard to complain over spilled cupcakes (or glitter).